Another attempt to add some humor to my scrapbook. I love making paper dolls, and have to be careful because I could have one or more on EVERY page I do if I let myself. I found this old photo of us at a friend's daughter's wedding reception . . . . dancing to YMCA! What wedding would be complete without this tradition? The photo was taken by someone else, and the quality wasn't the best, so I decided to de-emphasize the photo and yet celebrate the moment by mimicking the dance using paper dolls. I Love the Stick Kids brand of dolls . . . because I think they allow for more movement and expression. I "surgically" cut them up and arranged the body parts so that each one was shaping a letter in YMCA. Then with some cardstock, chalk, and scissors I copied the clothes we were wearing including shoes, toenail polish, and jewlery. Of course you have to wear a silly "Village People" hat when you dance to YMCA . . . and we all had one on. I duplicated the hats including the indian feather headdress that I was wearing. I cut the feathers from cardstock using some decorative edged scissors. I then chalked them, layered them onto the headpiece, added some gold Beedz for the band, and a gold rivet at the earpiece . . . . giggling the whole time I was working on it. The rest was easy. I mounted the photo onto cardstock, followed the pattern and cut out the center of a sheet of printed vellum and layered it over my background. 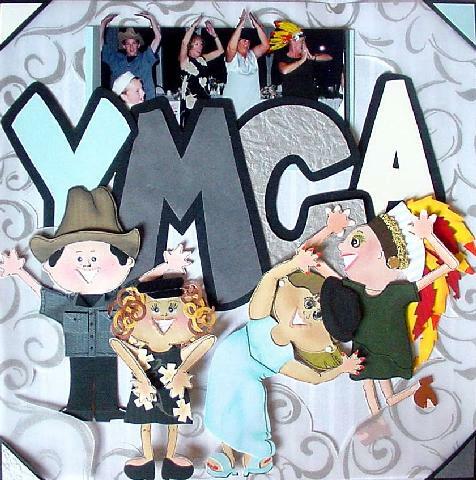 It needed something else so I cut out the huge YMCA letters using various textured papers and mounted them onto black cardstock. Used the scraps to cut corners for the page and then mounted the finished paper dolls at different heights using pop dots. Not much journaling needed. The names, date, and event was handwritten on one of the large letters. What a Blast! I smile every time I look at this one. Don't you?